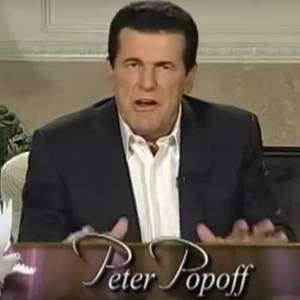 Peter Popoff claims to be a faith healer, but in reality he has proven to be fake healer. He also claims to receive divine revelations about people who attend his services, as well as those whom he contacts via mass mailings. Popoff would call out a medical condition and wait for someone to respond to it. Alternatively Popoff would approach someone in his audience and tell that person something that God allegedly had revealed to him. He would then proceed with his ‘faith healing’ routine. But it is all part of an ongoing series of scams. Many Christians — particularly those from an evangelical and/or charismatic background — are familiar with the “spiritual gifts” described in 1 Corinthians 12:4-11, Romans 12:6-8, and 1 Peter 4:10-12. These gifts are considered to be special abilities given by the Holy Spirit for the common good. One such gifts is the so-called “word of knowledge,” in which someone is given supernatural knowledge about a person or situation. Such information is often given in the context of a faith healing service. However, in 1986 Popoff’s alleged revelations were exposed by hoax debunker James Randi as a scam. Despite Randi’s high profile, hoax-busting was unprofitable until 1986. That’s when he took on TV faith healer Peter Popoff. Suspecting that Popoff’s hearing aid was really a radio receiver, Randi got a private investigator to bring a scanner and tape recorder to the faith-healing sessions. The scanner picked up Popoff’s wife, Elizabeth, calling, “Petey, can you hear me?” and reading information audience members had written on “prayer cards” or mentioned to ushers. Within months, Popoff was bankrupt. The television evangelist, self-proclaimed prophet and faith healer says a packet of his “miracle spring water” has cured cancer and even made money miracles. His cross-country crusade has created quite a following who believe in his message. “He’s amazing. He’s an awesome man. He’s a godly man,” a follower said. If you miss his sermons on the small screen, you may have received his message in your mailbox. The Troubleshooters received about a dozen letters from Popoff after they requested some of the miracle water. Each letter was personally addressed to the Local 2 producer. “Robert, God has given me something that I must give you,” the letter said. Computer-generated type was made to look like handwriting. The Troubleshooters weren’t the only ones getting the “personal” letters. “He wrote it just to me. Well, it was several letters,” a follower said. “I’ve been writing and he’s been writing me back,” another follower said. The Troubleshooters’ producer also received an invitation to the so-called “personal inner-circle service” in Houston. Local 2 brought the invitation and its hidden camera inside hoping to see Popoff performing miracles. But what the Troubleshooters saw seemed more like a sales pitch. “A lady came down. She said ‘Brother Popoff, I wrote you. You wrote me back. You told me exactly what God was going to do. And I have been made a millionaire.’ Are you hearing the truth? How many people here tonight would like to be a millionaire?” Popoff said. Popoff’s message, the same in person as in his letters, always focuses on your finances. In one letter, he told the Troubleshooters that he sees a “beautiful home, a swimming poll, even some beautiful cars” in their future. He also told them, “Show God you mean business by putting him first with a seed of faith offering.” Popoff even suggested a specific amount to give to his ministry — $17.11 to activate Kings, Chapter 17, Verse 11. Or for those at their wits end who really need to “prime the pump,” he said to send $117.11. Dr. Keith Jenkins, president of the Houston Graduate School of Theology, watched Local 2’s video. “His message is send me money, and God will send you money,” Jenkins said. He said Popoff is not praying for his followers, but rather preying on them. “Just the whole approach of the letters, and the supposedly personal approach of that, plays on the weaknesses of people who want to feel important, who want to feel that people care about them,” Jenkins said. Some 20 years after he was caught on tape, Popoff has developed a faithful new following. His most recent tax return showed all the donations added up to $9 million in one year. The Local 2 Troubleshooters wanted to know what he did with the money. Popoff refused their request for an interview. But the station discovered those seed gifts paid him a $425,000 salary. Four family members also pull down six-figure salaries each. “I would say it’s one of the most shallow and deceptive representations of the Gospel that I’ve ever seen,” Jenkins said. Peter Popoff — Back to His Old Tricks, by Sandy Simpson, documenting one of Popoff’s favorite marketing tricks. Peter Popoff Miracle Ministry. Official website. If you ask us, the ‘miracle’ is that people still fall for these type of scams.